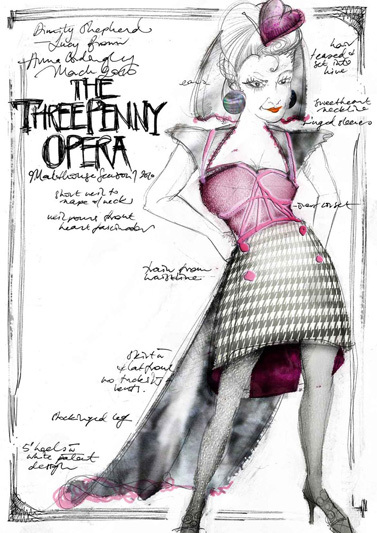 Where did you look for inspiration for the costumes in The Threepenny Opera? All over! The Threepenny Operareference pool was ridiculously disparate. Michael Kantor the director and I looked at Japanese FRUiTS magazines, kitsch 18th Century Chinoiserie as appropriated across the Continent, Kathoei - or Thai Ladyboys - and other contemporary and traditional transgender fashions. We observed the extravagance of TV's World Wrestling Entertainment, Melbourne during the Spring Racing Carnival and we watched early gangster films. Peter Doyle's compilation of Sydney police shots from the early 20th Century to the 1940s was pivotal too. So, a little high and a lot low art involved. Did you love playing dress ups as a child? What was your favourite childhood costume? I did love playing dress ups! Our dress up box was a monitor-top trunk filled mostly with remnants of fabric my mother had bought in India and Sri Lanka. So we - my sisters and I - became adept at folding and tucking lengths of cloth into regal trains, quick little capes and elegant (if peculiar) Saris. When/why did you decide to become a costume designer? I was taken to see an Opera Australia's Marriage of Figarowhen I was eight and, because the tickets were complimentary, my father and I sat separately. I sat amongst strangers in the first row of the circle and I think a combination of the brilliance of the set design (I design sets & costumes) and the independence I felt perched there alone instilled, then & there, a real desire to work on stage. 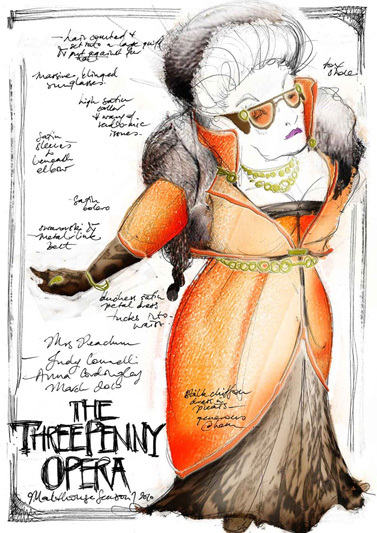 Which costume designers do you most admire? I could watch Peter Greenaway and his team of collaborators until the cows come home. They're dated works, of course, but there's wit and style in every design decision. The Draughtsman's Contractfrom 1982 is my favourite. Cinematography was Curtis Clark, art direction by Bob Ringwood and costumes by Sue Blane. What is the best costume you've ever created for a fancy dress party? Sacrificial Virgin. The party rule was 'S' nouns and concepts. I wore a wedding dress with a metal tent zipper sewn up through the middle, the bust torn out and lacework nuked. It improved throughout the evening as wine was spilled across the pearly satin. 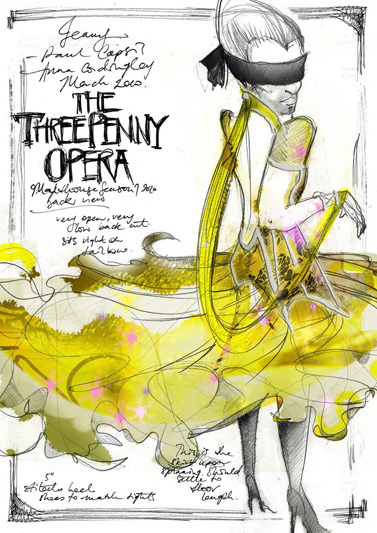 What is your favourite costume that you have designed for a theatre production? I loved dressing Julie Forsyth in Dario Fo's Elizabeth: Almost By Chance A Womanat the Malthouse Theatre in 2010. The indulgence we were afforded for all things design was a wonderful treat. 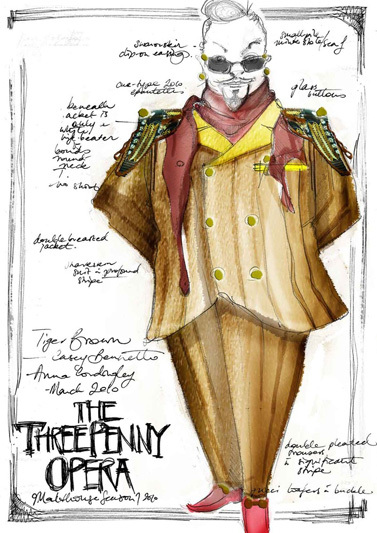 What is the biggest challenge of being a costume designer? There's something a little special about the last week with a costume before it goes off into the theatre. It's the precious time you have to give the items - usually of brand-spanking new material and sassy made-to-measure structure - character. Every play demands something different, but the costumes ought to feel lived in and loved for an age before the audience intercepts the action. That's a challenge. Just the right amount of sun-bleach on a collar or scuff mark on a toe. Researching and drawing. Ad infinitum. Well, not ad infinitum. Deadlines draw you to a halt and you race to a presentation date. But I love getting lost in the research phase. 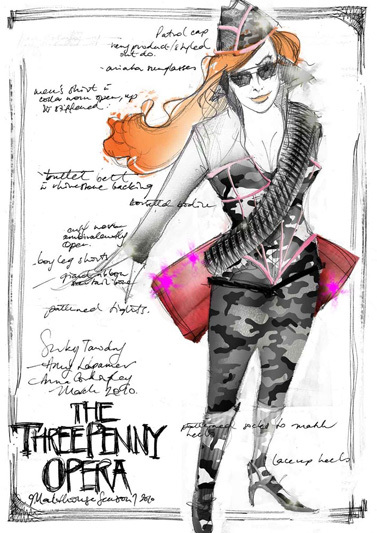 Briefly describe the process you used to work with Set Designer Peter Corrigan and Director Michael Kantor on The Threepenny Opera. Peter is one of the most audacious set designers I know and I was prepared for him to create a wild world, one that appropriates the lewdness and crassness of our own and reforms said themes into expressionist forms. Often of not-so-pleasing colour and texture. That's his way and I rather adore it. It's not shy. So I watched his world evolve and then stitched my world of Chinoiserie, WWE, FRUiTS and Kathoei within it, borrowing from his palette and flavour. What is the one costume you would love to design one day? I'd love to design The Rise and Fall of the City of Mahagonny, actually. I've often imagined marrying Gertrude Stein's The Good Annawith Fatty and Moses. 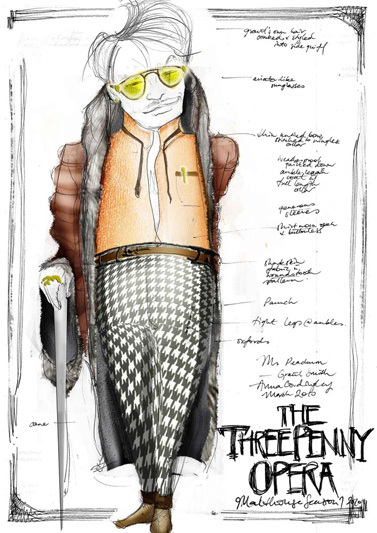 How important is the personality of the actor to the creation of a costume? Enormously. The actor makes the costume - there's nothing more disturbing than watching an actor struggle in their skin. 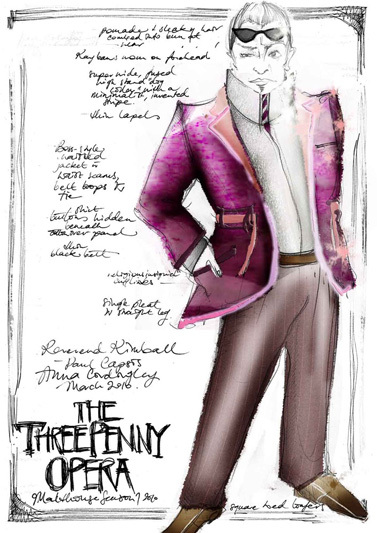 The costume needs be an amalgam of overarching design concept and detail arising in the rehearsal room. What is the most complicated costume you have ever designed? Chunky Move's Connected, which played in Sydney earlier this year, could easily take that award. Dance costumes are something else again and in this instance, I designed very low profile harnesses with pick-ups strong enough to take the tug of Reuben Margolin's 220-stringed kinetic structure. Little body lugs were placed upon the main hinging points of the body; shoulders, elbows, waist, knees et cetera. We turned the dancers into armatures - satisfying but incredibly complicated.